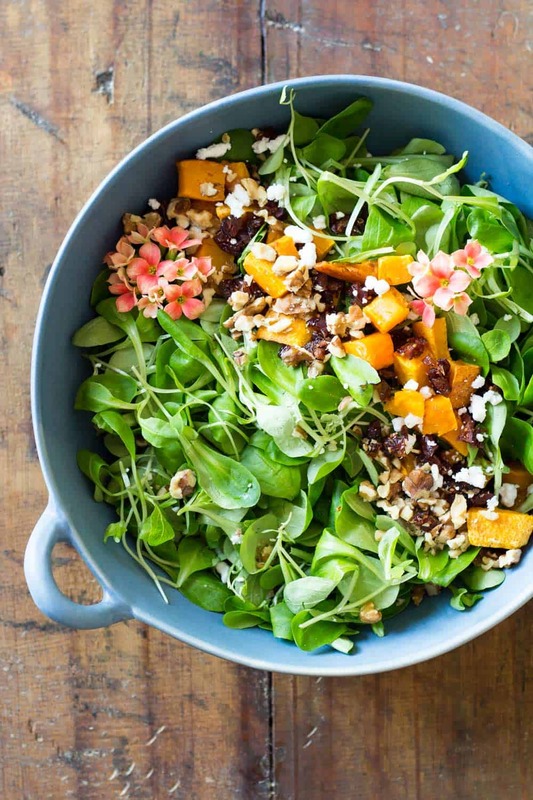 This healthy Roasted Butternut Squash Salad is the absolute ultra perfect fall salad. 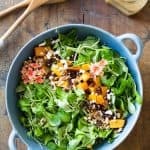 Warm butternut squash cubes, delicious dried cranberries, crisp walnuts, soft goat cheese and silky lamb’s lettuce with the best salad dressing in the world – Maple Mustard Balsamic Dressing. As of this week I’m leaving the house at 7 am every morning and it’s becoming quite chilly now at night and the mornings start feeling like the next season has already arrived. It all tends to start and end with butternut squash. The easiest available and fairly inexpensive deliciously nutty flavored, gorgeously orange colored cucurbita moschata. Can you tell I love butternut squash? I’ve been waiting for the moment to make a Roasted Butternut Squash Salad for weeks now. I did not quite feel like making it for the blog yet. I know, nobody really wants summer to be over. You have to remember though, there is fall before winter. The most wonderful season of the year. Roasted butternut squash tastes great with cranberries, or with goat cheese. So I figured I would combine all three of them and also add some walnuts because walnuts go so well with cranberries and goat cheese. For the lettuce I wanted something soft. Not necessarily crunchy. Crunchy is great for spring and summer, right? For fall and winter we need soft and silky though and lamb’s lettuce was screaming to be thrown into this salad. I kid you not, the combination of textures, flavors and colors is beyond amazing in this salad. Words can’t give it the credit it deserves. The best way to prepare butternut squash for salad is to peel, dice and roast it. If you cut it in half and roast it as halves (favorite way for most people), you won’t be able to cube it afterwards. The flesh will be so soft it can only be spooned out of the skin and will be all mushy in texture. Great for mashed squash or soup but not so great for adding to a salad. The same applies to cooking. If you peel and dice the squash but cook the dice in water, you have to either undercook them so they don’t fall apart or you risk ending up with mush or soup again. The best way is to peel and dice, cover in salt and olive oil and then roast until perfectly crips on the outside but silky soft in the inside. Pure perfection! 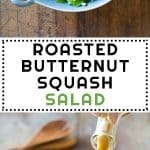 This healthy Roasted Butternut Squash Salad is the absolute ultra perfect fall salad. 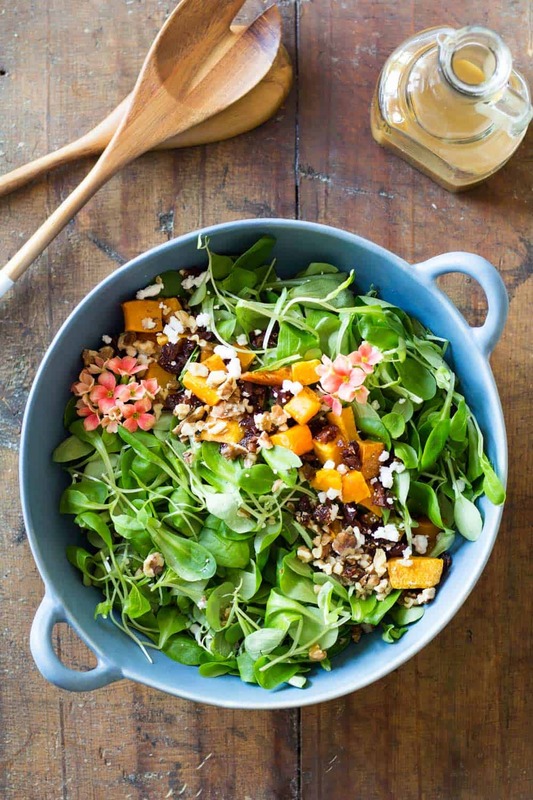 Warm butternut squash cubes, delicious dried cranberries, crisp walnuts, soft goat cheese and silky lamb's lettuce with the best salad dressing in the world - Maple Mustard Balsamic Dressing. Peel and dice butternut squash into about 1/2" big dice. Put butternut squash dice onto a large non-stick baking sheet (or laid out with parchment paper) and drizzle olive oil over it and sprinkle salt over it. Move around with your hands so all dice are evenly covered in oil. Roast for 45-50 minutes until soft. 5 minutes before roasting time is over, wash and spin dry lamb's lettuce. 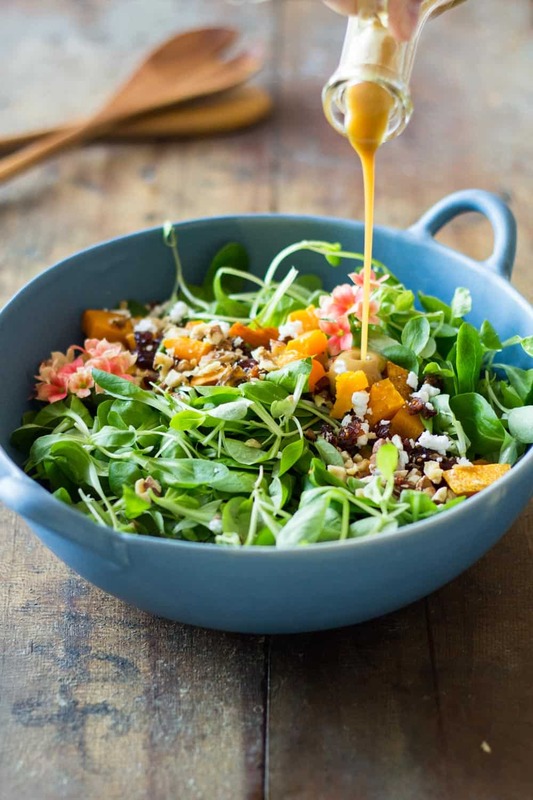 Prepare Maple Mustard Balsamic Dressing. Chop dried cranberries and walnuts. Add all ingredients to a large salad bowl pour dressing over it, mix and serve immediately.